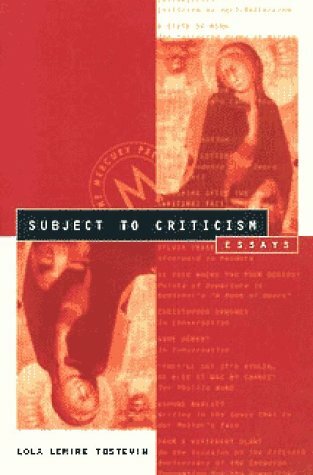 THROUGH A VARIETY of critical approaches, Subject to Criticism juxtaposes the literary with the personal, the theoretical with the biographical. Within the context of essays, reviews, letters and interviews, Lola Lemire Tostevin examines the writing of other writers and identifies recurring themes that stimulate her own writing process. Her views are often provocative, sometimes ambivalent, even rebellious, as she expands the usually objective stance of literary criticism with intimate and subjective experience. Lola Lemire Tostevin has published six collections of poetry, including Site-Specific Poems (Mercury). She has also published two novels, Frog Moon (Cormorant) and Jasmine Man (KeyPorter), and one collection of critical essays, Subject to Criticism (Mercury). Her third novel, The Other Sister, will appear in late 2004.